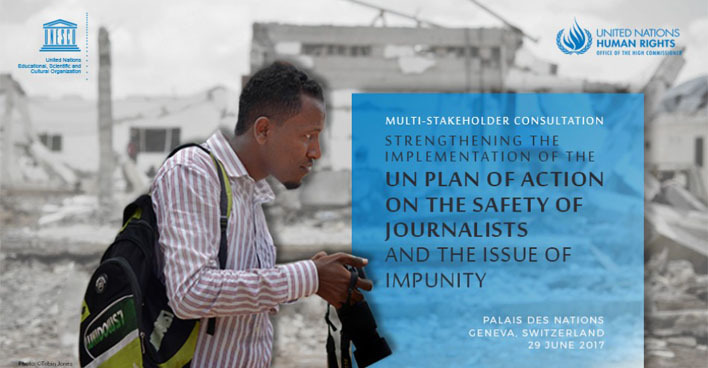 The multi-stakeholder consultation will bring together key stakeholders to take stock of developments in the area of safety of journalists and the issue of impunity, within the context of the first five years of implementation of the UN Plan of Action on the Safety of Journalists and the Issue of Impunity. Member States, UN, intergovernmental organizations, non-governmental organizations, media and professional associations and members of academia will gather to assess their achievements, consider the future and share best practices. The Consultation is organized by UNESCO and OHCHR. The UN Plan of Action was elaborated to provide a comprehensive, coherent, and action-oriented UN-wide approach to the safety of journalists and the issue of impunity. Since its launch, it has become a guiding framework for activities in this area. Following its endorsement by the UN System Chief Executives Board for Coordination in 2012, the UN Plan of Action has been welcomed by the UN General Assembly, UNESCO and the Human Rights Council. Outside of the UN, it has been referred to by various regional bodies, and it has given impetus to and fostered a spirit of co-operation between the UN and various stakeholders in many countries. The issue of safety of journalists and ending impunity for human rights violations committed against them, in both conflict and non-conflict situations, is gaining momentum within the framework of the Sustainable Development Goals (SDG) that make up the 2030 Agenda for Sustainable Development. In particular, Goal 16, which provides for peaceful, inclusive and just societies with effective, accountable and inclusive institutions, highlights the protection of fundamental freedoms and public access to information. Journalist safety and ending impunity for human rights violations are critical components of achieving this goal. Given this momentum, as well as the ongoing challenges and their extension to the online environment, there is a need to bring together key stakeholders to assess the achievements that have been made in the context of the implementation of the UN Plan of Action and determine the areas that still demand greater attention. During the one-day event, they will identify primary achievements, gaps and challenges in the previous and existing work on safety of journalists, as well as to devise recommendations for future work in the context of the UN Plan of Action. This will be reflected in an outcome document that will give direction and impetus to both the separate and coordinated activities of all stakeholders. For more information on the Multi-Stakeholder Consultation, please find here the concept note. It has been compiled based on the longer report (above) which aggregates contributions from key stakeholders. Further suggestions building on the consultation process to date can be submitted to m.benchelah@unesco.org (link sends e-mail) (cc: s.mccabe@unesco.org (link sends e-mail)) by COB July 21, after which it will be finalized by UNESCO and OHCHR as a non-binding outcome document that can inform stakeholder actions going forward.